After a long day, we ate our way through Eat Street and tried many different dishes. When we arrived at Eat Street, the delicious smells were a great improvement to some of our time spent with trash, trains, and toilets, and my nose welcomed the change. The abundance of fried foods and treats reminded me of fair food but Indian style. Many vendors were selling Chinese food, and we tried the gobhi Manchurian, which is fried cauliflower with spices. It was interesting to try the Indian take on Chinese food. 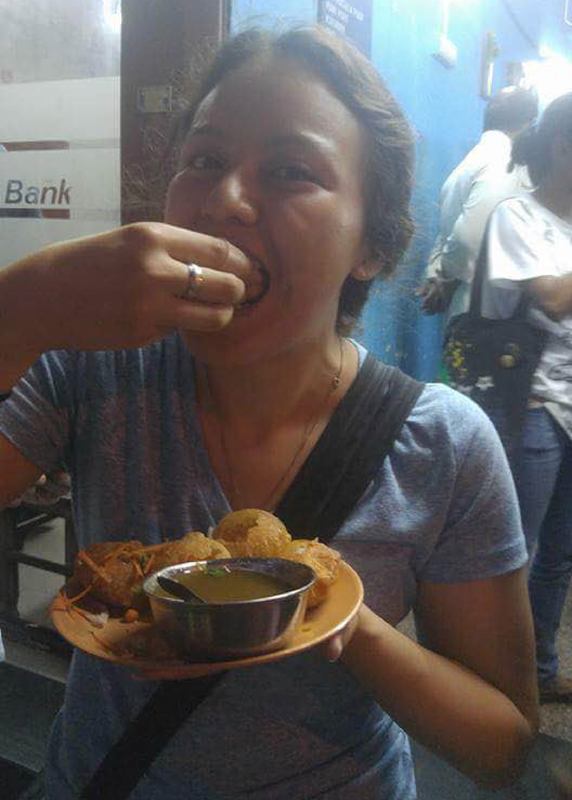 Panipuri is a popular Indian snack that we tried. Pani means water and puri is bread. There is a hollow fried chip with crunchy peas, onion, and chickpeas inside, and the broth is served on the side. You spoon the broth into the chip before enjoying the snack. We all agreed that we were too full for more, but couldn't resist some dessert. Kulfi is an Indian ice cream, and it was delicious. There were many flavors including strawberry, mango, and saffron. The cold treat was a fantastic way to end the night and let our mouths recover from all of the spicy food.